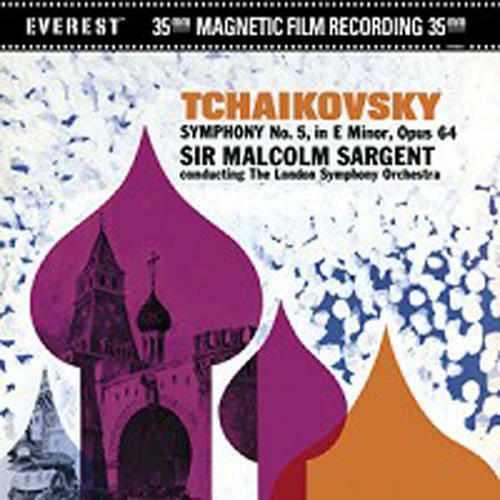 (DVD + CD set) Sir Malcolm Sargent conducts the London Symphony at Walthamstow Town Hall, London in a beautifully colorful interpretation of Tchaikovsky's infamous Fifth Symphony. The Fifth Symphony was at first considered a failure by the composer after its first few performances were poorly received. Further performances proved to the composer and the critics that, in fact, this great Symphony was worthy of further consideration and ultimately widespread acceptance. Orchestras around the world now perform Tchaikovsky's Fifth Symphony routinely to the thrill of their audiences. This Bert Whyte Everest recording in 1959 directly onto three channels of 35mm magnetic tape captures all the dynamic nuance of Tchaikovsky's multi-layered orchestration in a way most other conventional recordings are incapable of doing. The original edited three tack 35mm master tapes were used for this HDAD release. Includes a bonus CD remastered. HDAD Plus is a 2-sided hybrid disc that will play in 24/96kHz on a standard DVD video player (no footage included) and in 24/192kHz on a DVD audio player.